This recipe was in the most recent Williams-Sonoma catalog. I've made it 2 times already, and love every morsel of it. My husband also enjoys it too much. Preheat oven to 450 degrees. Blot chick dry with paper towels. Tub back sides with oil; season on both sides with pepper. Place chickens, breast side up; tuck wings behind breasts. Drape bacon slices over breasts. 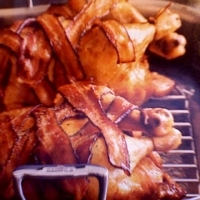 Place chickens, bacon side up, on rack in roasting pan. Roast until thigh registers 170 degrees (approx. 1-1.25 hrs), tent chickens with foil if bacon becomes too dark. Transfer to carving board, tent with foil. Discard all but 2 tsp fat from pan. Set pan over medium-high heat; warm reserved fat. Add shallots; cook 2 minutes. Add flour; cook 30 seconds. Add wine; whisk in demi-glace and broth. Simmer 3-4 minutes. Off heat, whisk in thyme and butter. Carve chickens. Drizzle with some of sauce; pass remaining sauce alongside. Serve with champagne. This recipe sounds really good thanks for the post and high fives to you and that cute little Mini Pin. This looks wonderful. Great idea about the onion rack and the demi glace substitution, too. Thank you. I really like your ingenuity in improvising a rack! This one is in my family's NEAR future! Like czekit7's recipes? Never miss an upload!